In 2017, Kevin Chappell held off Brooks Koepka for his first Tour victory. Chappell continually knocked on the door in 2016 with 4 runner-up finishes and finally broke through in his 180th PGA Tour event. 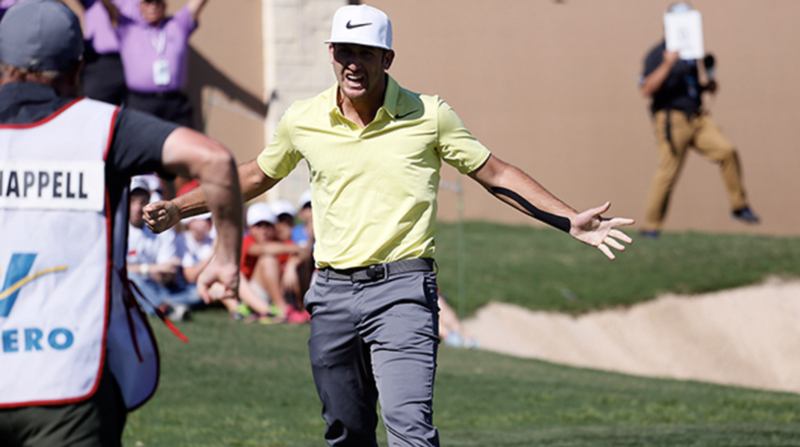 Koepka tied the low round for the tournament with his Sunday 65, but a birdie on the 72nd hole gave Chappell the victory. The host is TPC San Antonio's Oaks Course, a Greg Norman design that Sergio Garcia consulted on. The fact that Garcia hasn't returned to the site that he helped build since 2010 should tell you all you need to know. The players agree as well. In a player poll by Golfweek, TPC San Antonio was voted the 4th worst on Tour behind TPC Four Seasons (no longer a site), TPC New Orleans and Torrey Pines. Notice any patterns here? The Norman Course fits the way the Shark played. It favors ball-strikers as evidenced by its recent winners, Kevin Chappell and Charley Hoffman. When it gets windy, things can get dicey due to the vegetation that borders the outskirts of each hole. World Amateur #1 Joaquin Niemann turned over his amateur status after the Masters and will make his professional debut at the Valero Texas Open. The 19-year-old phenom has spent the better part of the last year as the top-ranked amateur. His crowning accomplishment thus far was his 2018 Latin America Amateur title, earning himself a spot in the Masters. He has already played in the 2017 US Open at Erin Hills as well. The rookie has upcoming sponsor’s invitations to the Wells Fargo Championship, AT&T Byron Nelson, and Memorial Tournament. It wouldn’t be Texas Open week without bringing up one of the most remarkable 16s in PGA Tour history. During the first round of the 2011 event, Kevin Na made the highest score ever recorded on a par 4 on tour. He would have needed 7 more shots to match the highest score ever recorded. With less star power this week at the Valero, you’re going to need Paulie’s help. Check out who he likes for Draftkings and one-and-done here. The LPGA heads out to Los Angeles this week for the inaugural HUGEL-JTBC LA Open. The LPGA previously held tournaments in LA during the early 2000s but has not been back to the area since 2005. This year’s event will be held at Wilshire Country Club. Originally designed in 1919 by Norman Macbeth, Wilshire underwent a large scale restoration in 2010 with architect Kyle Phillips. Phillips restored the original bunker styling and renewed the green surfaces to their original sizes. The team also instituted large scale waste areas to help with irrigation. The course tips out just over 6,500 yards and will be the perfect host for an LPGA event. A player to watch is reigning NCAA Champion Braden Thornberry, who is set up for a marathon week. He played 3 rounds (and won) at Mississippi State’s tournament on Monday/Tuesday and will tee it up as a sponsor’s exemption. Thornberry has won four times this season at Ole’ Miss and finished t4th last year at the PGA Tour’s FedEx St. Jude. Golf course architect Tyler Rae joins the podcast to talk about his career. We begin our conversation with a lengthy discussion on the brilliance of Donald Ross, his most under-the-radar designs, and the traits that make his courses unique. The conversation then moved to Tyler’s career and experiences working for some of today’s best architects. Listen to the podcast on iTunes, Stitcher or the website. The European Tour is in Morocco for the Trophee Hassan II, full preview. Fox Sports announced that it plans to air 45 hours of coverage for this year’s U.S. Open. The Junior Ryder Cup selection process has been announced.